Is there anything more exciting than airdrops? To promote liquidity across the NEO community, Spotcoin is giving away up to $200,000 US worth of SPOT exclusively to select NEP-5 token holders. We’re treating holders of not just one, but of 4 different NEO based tokens to free SPOT. Be sure to join our Telegram group Spotcoin Team and register on Spotcoin.com if you hold one of these NEO tokens: EFX, SWH, RPX, or QLC. 3. On the dates below, fill out the pop-up with your Telegram name and the NEO address where you hold your Effect.ai (EFX), Switcheo Network (SWH), Red Pulse (RPX), or Qlink (QLC) tokens. Your SPOT will be delivered to the same NEO address once we’ve completed our post-ICO third party audit. Another week, another airdrop. Mark your calendar! Each NEP-5 token will have its own unique airdrop and its own timeframe to register. SPOT is being given away on a first come, first serve basis so better be quick! The amount of SPOT you will receive will depend on the amount of partner tokens you hold. You can see the date and the tiers below, with the corresponding tiered payout. 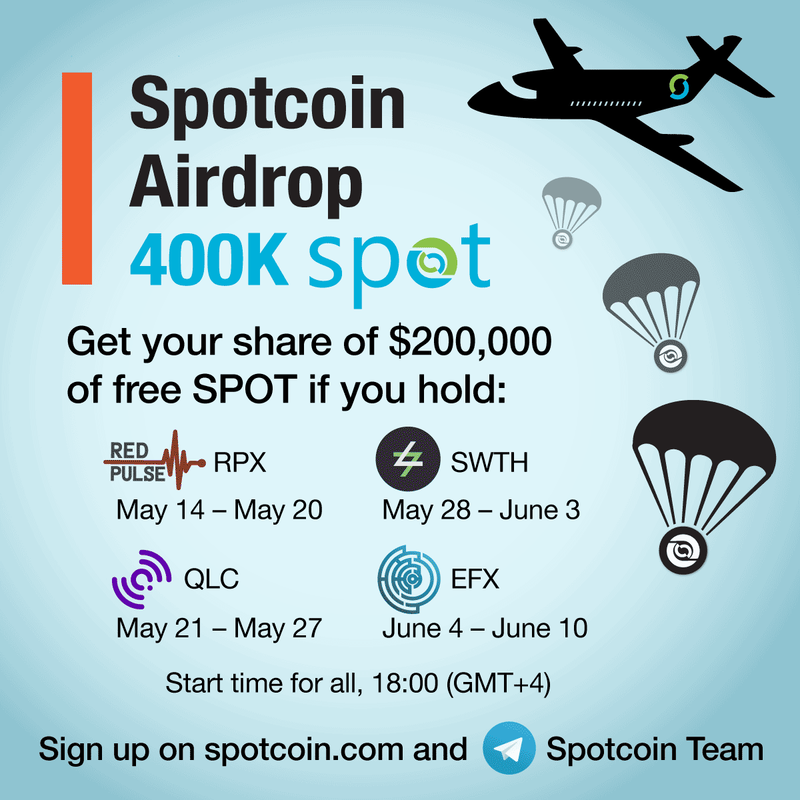 SWH and EFX token holders joining in the SPOT airdrop also stand a chance to win a Ledger Nano S! What time will the registrations begin? 6pm (GMT+4:00) on the first day of the registration period. Why am I not able to see the airdrop registration pop-up when I login to my Spotcoin account? The pop-up will appear during the respective registration dates. How do you know how many partner tokens I have? We will conduct an automatic snapshot of the NEO blockchain on the day you submit your application to see what amount of partner tokens you hold. Which wallets can receive the SPOT airdrop? All non-exchange wallets can receive SPOT; however, some wallets may not display the token. We recommend the O3 and NEON wallets. Read more here about how to add NEP-5 tokens to the NEON wallet. Can I participate in multiple airdrops? Yes! Come back on the applicable registration dates and reapply for the respective airdrop. Residents and citizens of the United States are prohibited from taking part in the SPOT Airdrop and the SPOT public sale. Residents and citizens of China and South Korea are prohibited from taking part in the SPOT public sales. However, certified accredited U.S. investors can take part in the SPOT private sale. Chinese and South Korean investors can participate in the private sale when paying with digital currencies, after signing the SAFT form and completing the KYC /AML process. Any investment in digital currencies comes at a risk. No one should invest money that he or she can’t afford to lose. Spotcoin makes digital currencies work for everyone through quick, simple trading. Digital exchange set to open in beta in Dec. 2018.